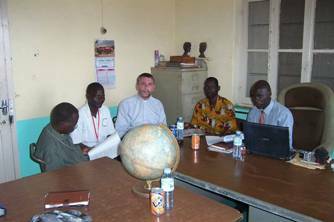 Two of our Trustees have just returned from South Sudan where they visited St Joseph's in Rokon. The school has been running since February 2011 and so far 90 pupils have been registered. Availability of and funding for trained teachers is scarce. The Trust has decided, therefore, to fund the training of 2 teachers. The students will be recruited from the Rokon area and will then work at St Joseph's when their training is complete in 2014. Gervase Phinn, lectrurer, brodacsater and writer will be headlining a fundraising evening in support of the Trust's work on November 3rd. Tickets cost £15 and include fine French wines, cheeses and nibbles. David Tomlinson, St Francis Vicarage, Burnhope, Newton Aycliffe, DL5 7ER. We are delighted to announce that all the works have been completed and the school has been equipped with furniture. Pupil registrations are under way and the school is due to open soon. We hope to have more news soon on this. Thank you to everyone who has donated so generously to make this possible. 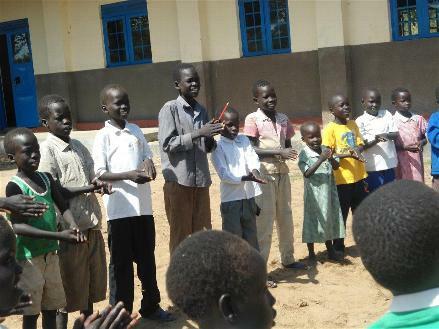 The Government of Southern Sudan (GOSS) changed the regulations for registering new schools. For this to happen the school now has to have store and staff rooms, latrines, kitchens… None of this is unreasonable – we would not even consider a school without them! - but it brought a halt to the hopes for an early opening for our school in Rokon. So, the Trust has just finalised plans and sent out a substantial payment to cover the cost of beginning these extra buildings. At current figures, the Trust is some £7,000 short of the total needed for these buildings. Therefore, we have a clear target for fund-raising in the next few months. We are hopeful of an opening of the school this coming April. John Sentamu, the Archbishop of York, has highlighted the work of the Trust in an article for the Daily Telegraph web site. The article summarises a speech he gave at the United Nations discussions on the Millennium Development Goals. The article can be viewed here. A contract to build a two classroom school in Rokon has been let, financed solely by EJT. Work began in May and is expected to be completed by September when we hope the school will start to be used. A big thank you to all who have donated money to help make this possible. On Thursday 10th January 2008 there is a fund raising concert to help raise money for the new school in Rokon. Come along to enjoy an evening of music and light entertainment. The concert begins at 8pm in St Johns College, Durham. Tickets £6 available from St Johns Reception or call 07882 183 063.